My top tip when buying a DJI product is to buy from a local and reputable dealer rather than direct from DJI; sending any faulty item back to Holland at your own expense can be costly. That’s not to say much has gone wrong over the years, but because I buy most of my gear from CVP - other retailers are available - you have the piece of mind that you are dealing with a UK-based operator and your contract is with them. The price - in this case £669 at the time of writing - is exactly the same as buying direct on the DJI website, and while I had to wait a couple of weeks for CVP to get it in stock, it came much sooner than anticipated. Now the opening sequence in this imaginary film edit is over, you’ve been hooked in with a scintillating tip we now fade to black, the music changes mood… and we move seamlessly onto the product itself, perhaps with a tasteful cross dissolve? Running with the GH5, no matter how good your duck walk will leave you with unwatchably shaky shots. The holy grail of filmmaking is for the camera to fly, to swoop, to follow seamlessly without glitch or any of that pesky interference that might otherwise jarr the audience out of their all-important bubble. To that end we spend endless time and energy stablising our shots. I have a large camera jib which is amazingly impractical and laborious. I have a drone which is so heavily regulated it’s almost unusable unless you are lucky enough to work for in-house aerial team at The National Trust. I have an indispensable glidetrack and a tripod, and whilst I wouldn’t go anywhere without those two bits of kit, there are times when they simply don’t quite cut the mustard. And so, many years ago I started my odyssey into buying hand-held supports. It began with the old counter-balanced Glidecam HD-2000 - I literally can’t believe it is still retailing for about £450! I never could balance it properly, I just didn’t have the patience. Then I got the original DJI Osmo the moment that came out and I loved the fact you could flick it on and you were away, but the camera just wasn’t good enough in low light and, whilst its own battery was fairly good you inevitably discovered you had no juice left in your phone or couldn’t afford to waste the battery you did have left!. It was less than perfect. And so finally the Ronin-S arrived, is this what I’ve been waiting for all this time? The build quality is great, really robust. Love the high quality foam carry case. Balancing took about 20 minutes first time round, watching along with the DJI instruction video, now everything is set up it takes seconds. Amazed how brilliantly it worked with the GH5 AND the considerably heavier Canon 1DC. The quick release plate fits my manfrotto tripods, though not all of them! It’s silent. The battery lasts for 12 hours. It’s amazing. So now the imaginary film edit we are in completes the Rocky sequence as we come up to the top of the steps for the last time. The epic point of view drone shot circles around my head and I hold the whole wonderful gimbal aloft triumphantly. Now cut to me sitting in a comfy chair by a fireplace. You’re about to get a few important details. I bought this product because I wanted something small and easy to set up, so it wouldn’t interfere with my run and gun ethos. I got it because at the moment it fully integrates with my favourite camera - the GH5. It does both of those things wonderfully. I’m no weightlifter but this gimbal is totally manageable, even with the Canon mounted I could operate it without a problem. In fact the infinitely superior autofocus on the Canon means this is probably the perfect small form gimbal/camera combination on the market at the moment. But with the Panasonic combined with the focus wheel and the on handle record button, you’ve got the next best thing. In short it ticked all the boxes I bought it for. Then it kept on giving. The capture menus on the Ronin App offer almost limitless opportunities to program repetitive movements, change all the motion parameters and control things from afar with your mobile phone. This means it could easily be used as a tripod at the front of a conference you’re streaming live on the web, or as a discreet camera out of the way at the front of a wedding. You could stick onto a boom pole and use it as a mini jib. All DJI need to do now is to add a live view to the mobile app and we’re away! I’m so excited about the creative possibilities of this incredible tool that I can’t believe it only cost £669. 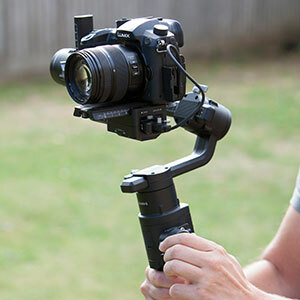 I almost can’t imagine I’ll be filming without it, and what’s more, it is going to do wonders for my arms. In short this is a must have piece of kit for anyone that needs stablised shots - which is everyone isn’t it?